Jordan Auctioneers are looking after the sale of this property, which is just 1.8 miles from Naas Main Street. Approached through a recessed granite entrance with electric gates to a sweeping gravel drive, the gardens are laid out mainly in lawn with wooden deck, detached garage, flower beds, and paved patio area, all enclosed by trees and hedges. 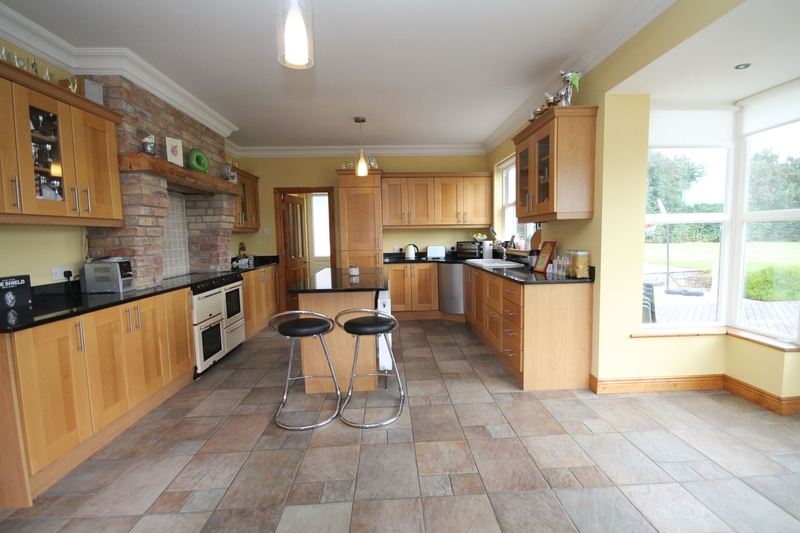 Situated in an excellent sought after location this family home is close to Caragh (1.4 miles), Newbridge (5 miles) and Millennium Business Campus (1⁄2 mile). Good transportation links are available closeby with the bus service in Naas, commuter rail service from Sallins direct to City Centre and M7 Motorway access at Junction 9 or 10. Some local sporting activities include leisure centres, GAA, rugby, hockey, tennis, golf, horse riding, soccer, horse racing, swimming, fishing, canoeing and Naas also offers a wealth of amenities. Accomodation includes an entrance hall with gallery landing and recessed lighting, sittingroom with granite fireplace, stove, bay windows and double doors leading to the dining room. 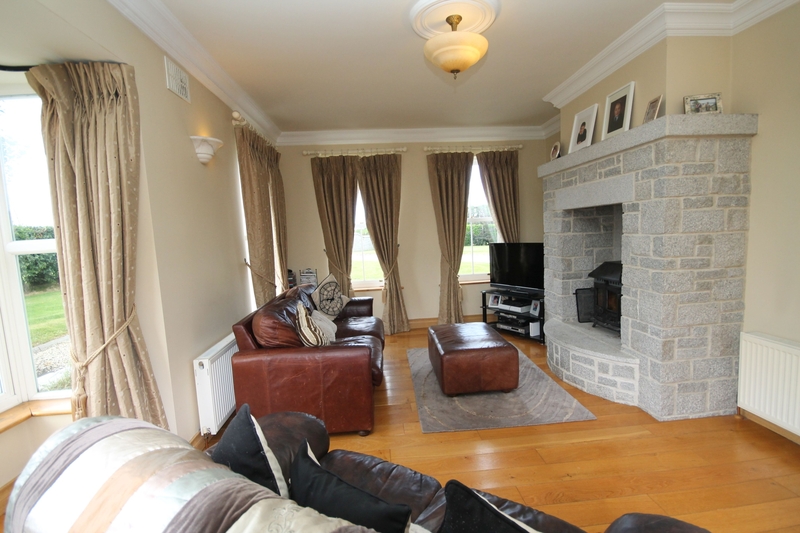 The living room/bar has a tiled floor, cast-iron fireplace and an integrated bar with granite stone built-in shelving. The kitchen also has a bay window and has a shaker style units, island unit, granite work tops and splashback, ceramic sink, integrated Electrolux fridge/freezer, Belling stove, extractor unit, integrated Bosch dishwasher, coving and French doors to rear garden. There is also a utility room, back hall and toilet downstairs. Upstairs leading off a ballery landing, there are four bedrooms. The master bedroom has a walk-in wardrobe, dressing area and ensuite with double shower. There is also the main bathroom and a hotpress. This home, which is set on .9 of an acre is fully alarmed and has oil fired central heating. There is also a detached garage with loft storage.